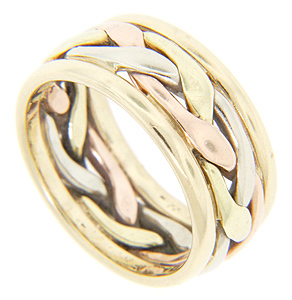 14K multi-color gold wedding band featuring a harmonious combination of gold colors. The center braided design is white, green and red gold. The edges of the ring are yellow gold. This band is 8.75 mm. wide. Circa: 1960. Size 5 1/2. It cannot be sized.